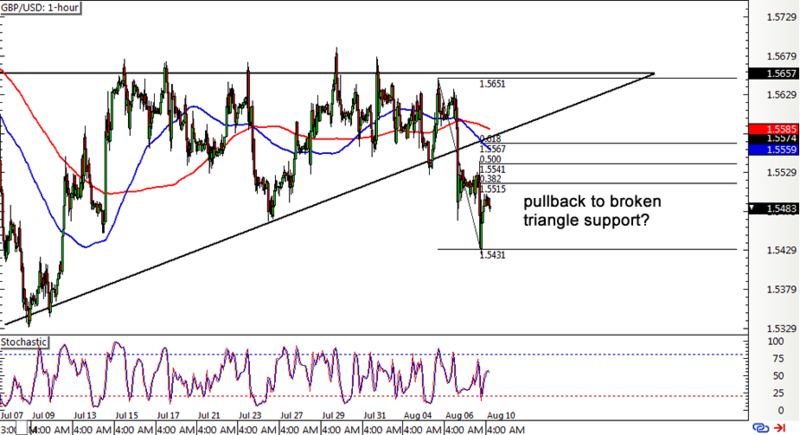 Missed Cable’s triangle breakdown last week? Don’t worry! You might still have a chance to catch the selloff on a pullback, possibly to the broken triangle support. Using the handy-dandy Fib tool on the breakout move shows that the 61.8% Fibonacci retracement level lines up with the bottom of the ascending triangle and the 100 SMA, which might hold as a dynamic resistance level. Note that the 100 SMA is below the 200 SMA, indicating that the pair could head further south. Also, the triangle forex pattern is approximately 300 pips tall so the resulting downtrend could be of the same size. Stochastic is on middle ground and barely offering any good clues at the moment, but pound bears could spring back to action once the oscillator hits the overbought zone. Here’s another forex chart pattern you might be interested in! 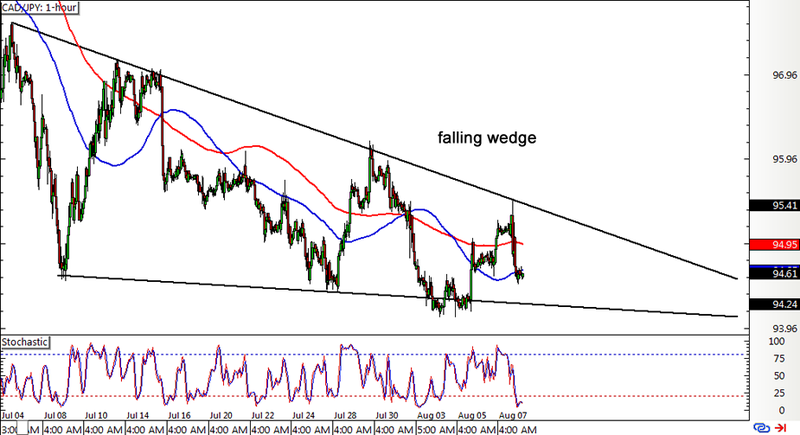 CAD/JPY has been slowly grinding lower, moving inside a falling wedge pattern on its 1-hour time frame. The pair just got rejected upon testing the resistance at the top of the wedge and is on its way back to the bottom around the 94.00 major psychological level. A bounce might take place soon since stochastic is already indicating oversold conditions but hasn’t turned upwards yet. If so, another test of the wedge resistance around the 95.00 handle might take place. For now, the 100 SMA is treading below the 200 SMA, suggesting that the path of least resistance is to the downside and that a break below the wedge support might be possible. Keep in mind that the wedge pattern is around 300 pips high so any breakout moves might last by the same amount. Looks like this NZD/JPY range is still holdin’ like a boss! 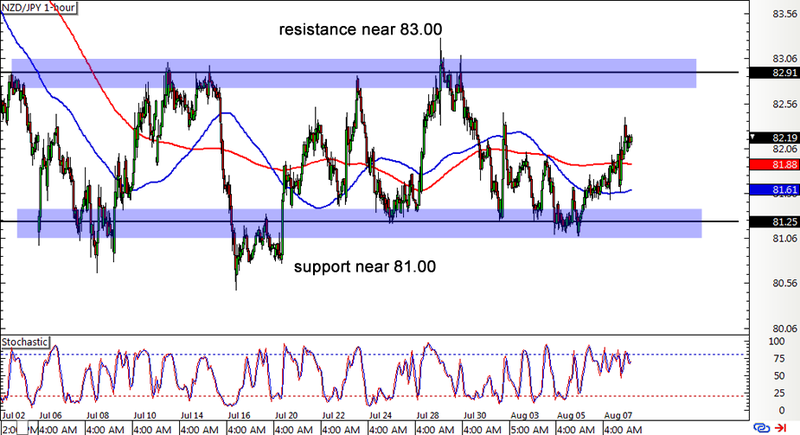 The pair recently bounced off the bottom of the range near the 81.00 major psychological support level and now has its sights set on the resistance at the 83.00 handle. Stochastic has been in the overbought region for quite some time, hinting that Kiwi bears are eager to jump in and push price back down. In addition, the 100 SMA is moving below the 200 SMA, which means that a selloff is possible right around the mid-range area of interest at the 82.00 mark. If you’re looking for a cautious entry, you could wait for an actual test of resistance at 83.00. If you think the Kiwi can’t head any higher, you could short at market and set a stop past the range resistance. Scaling in at these entry points might also be a good idea!